In a season where consumers exchange expectations of peace and goodwill for short-lived marketing ‘magic,’ Rob Tennant’s impressively on-point Booksmart is an entertaining call beckoning us back to a sane conscience for the holidays. 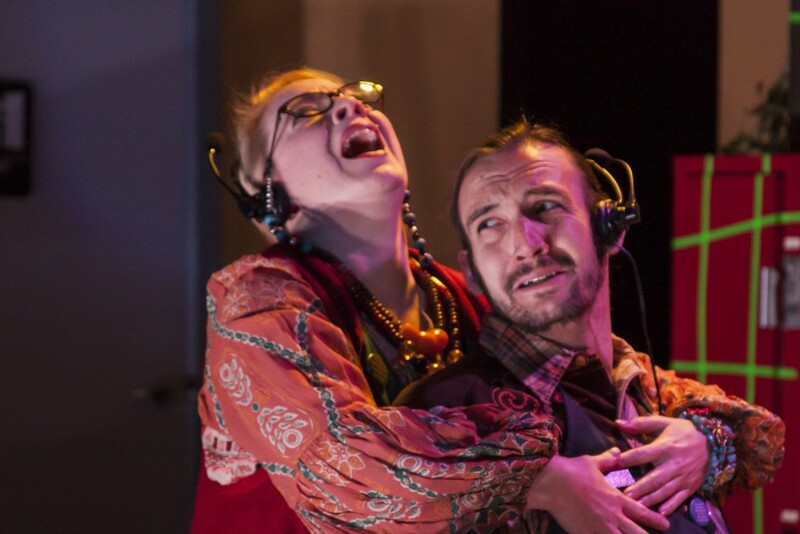 Plan-B Theatre’s production, which has sold out the house in every performance, is as pitch perfect as an original holiday show can be. 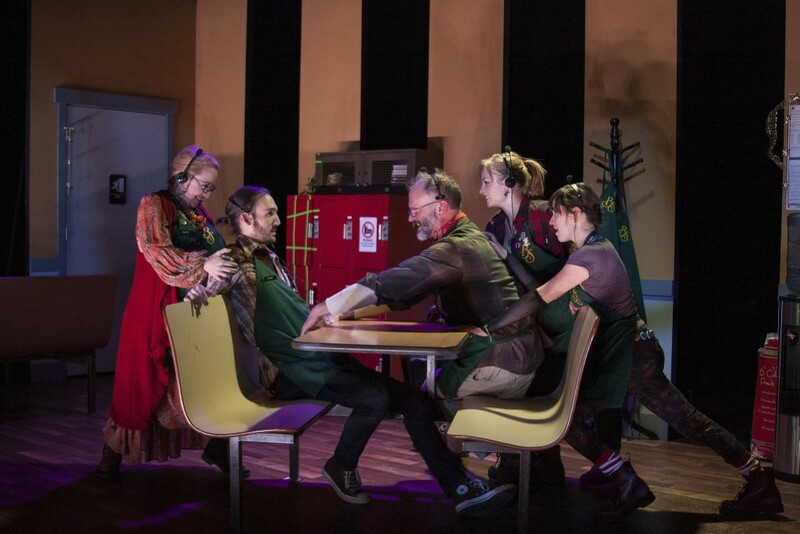 From Jerry Rapier’s direction to a quintet of actors who make their roles rock-solid believable with the right comedic effect, Booksmart succeeds in bringing audiences directly into the break room where employees of this fictional big box bookselling retailer escape to and commiserate with each other. Rounding out the effect nicely is an ingenious little ‘War on Christmas,’ courtesy of Cheryl Ann Cluff’s sound design and music selections. It is almost frightening how many renditions of Rudolph the Red-Nosed Reindeer are available, interpreted in every musical genre that comes quickly to mind. Tennant’s play works so well in how it balances realities with comedy that it could be one of the more effective elements in a union organizing campaign for retail workers who are as underpaid and exhausted as they are abused and exploited by their callous employers. 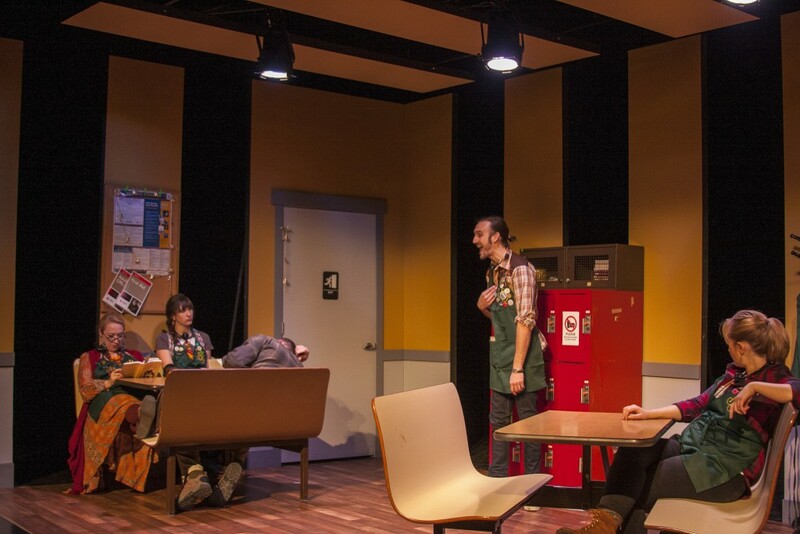 Never appearing preachy, the compactly written play captures a fairly comprehensive range of retail workers and what they must endure especially in the final furious days before Christmas. Booksmart is Tennant’s first play to be produced. It was selected (along with Carleton Bluford’s Mama) unanimously in a blind reading process involving 24 submissions from Utah-based playwrights 35 and younger in the inaugural competition for the David Ross Fetzer Foundation for Emerging Artists (The Davey Foundation). There is Casey, who is trying to recruit his peers to join his protest either by stopping or slowing their work. Out of college with degree in hand, he sees more inertia than momentum in his career path while trying to figure out how to reduce the debt from student loans. Alex, smart and responsible, faces having to move because she can no longer afford the apartment rent. Cindy, the youngest of the group, is commendable in her youthful resilience to stay even the lightest bit cheerful when facing down the most belligerent customer. She wants to take game design courses in college but needs to save up money for them. Ruth is growing weary that as she approaches the end of her forties she has little to show for in financial long-term security. Ed is suspended in an oddly funny limbo – a hippie with authentic roots who might seem a bit flighty but who also understands just how retail work wears on the soul and why medicinal comfort is always welcomed therapy. Sarah Danielle Young shapes the character of Alex with the chemistry that grows in her interactions not only with her co-workers but especially Casey as she warms toward the purpose of his cause. Alex certainly would draw a chorus of ‘Amen’ from frazzled retail employees who are more than familiar with the circumstances she describes in trying to find books for customers on the vaguest of descriptions or attempting to explain to customers that she has no control over pricing or dealing with exasperations of non-denominational protocol in a holiday season when everyone can be so easily offended. This is the fourth year in a row that Plan-B, in the midst of a perfect 25th anniversary season so far, has offered a holiday show and with Booksmart, the canon of alternative holiday entertainment is shaping up very nicely. The first two years brought Radio Hour episodes – an outstanding Matthew Ivan Bennett adaptation of Sir Arthur Conan Doyle’s only Christmas tale (Sherlock Holmes and The Adventure of The Blue Carbuncle) and the deliciously demented Fairyana by Eric Samuelsen. 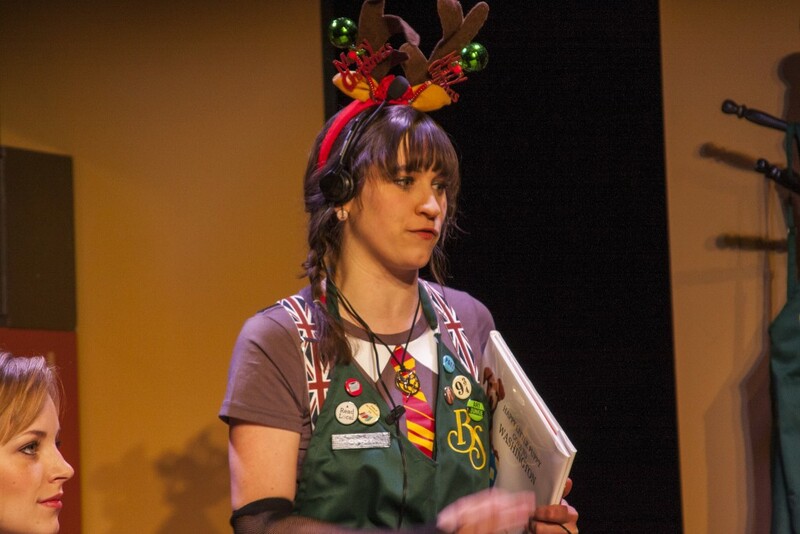 Last year’s full-length production of Christmas with Misfits by Julie Jensen comprised sensitively comedic tales of how people can dictate their own terms for celebrating the holiday. Booksmart complements the set of holiday productions perfectly, more than gently reminding people that perhaps we should think about the expense of taking bit by bit pieces of our humanity and soul when it comes to the mad dash of commercialism in pursuit of holiday perfection. And, Casey and his fellow workers are just asking for a simple modicum to find their own happiness – which is a holiday season goal that no one should ever deny. 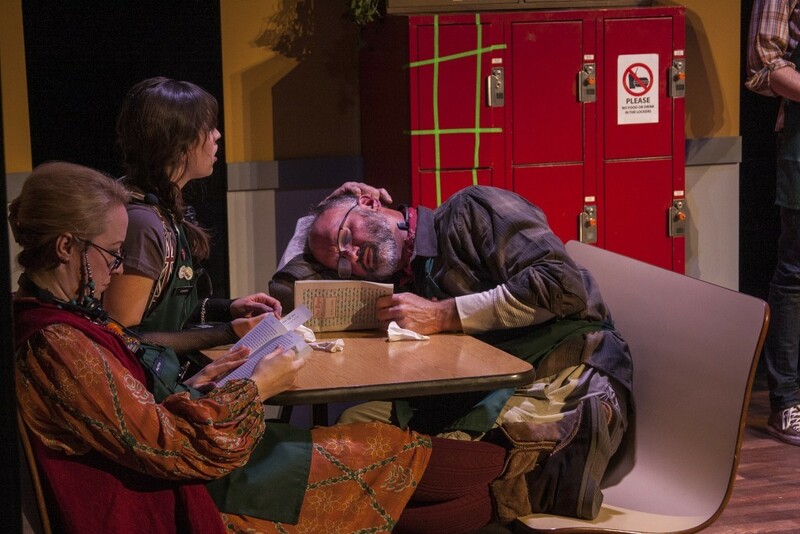 The show ends its run of 11 performances at the Studio Theatre of the Rose Wagner Center for Performing Arts on Dec. 13. Plan-B has set a pre-paid wait list that begins one hour before performances, and individuals must be in the box office, in person, to be added to the list. At show time, those on the wait list will be seated, in order, in any open seats. Those unable to be seated will receive a full refund. For more information, visit Plan-B. All photos, courtesy of Rick Pollock.